In the shadows of downtown Cleveland there are fish, big fish. It may not be the most idyllic setting for a steelhead fishery but the steelhead that run up the Rocky River from Lake Erie every fall really don't care. Nor should you if you want to hook-up with some chrome. The Rocky River is one of five Lake Erie tributaries stocked with Manistee strain steelhead. If you are wondering where to find these magical fish, the Ohio DNR has a pretty good map showing designated steelhead trout fishing areas and public access points along the Rocky River. Fun Fact: Rocky River was named one of the “150 Best Places to fish in America” in the June 2007 issue of Field and Stream magazine. The Ohio DNR map is great and all but if I'm going to drive 7 hours to fish a river I've never seen, I want to know where I'm going, exactly where I am going. So I created this Google map of Rocky River fishing spots including the 13 Ohio DNR designated steelhead trout fishing areas and public access points. Included are the Emerald Necklace, Rock Cliff Spring, Madison Pool, Horse Ford, Morley Ford, Lorain Rd Bridge, Blue Bank Pools, Mastic Woods, South Mastic Picnic Areas, Brookpark Overpass, Cedar Point Area and the Lagoon Dam steelhead fishing areas. 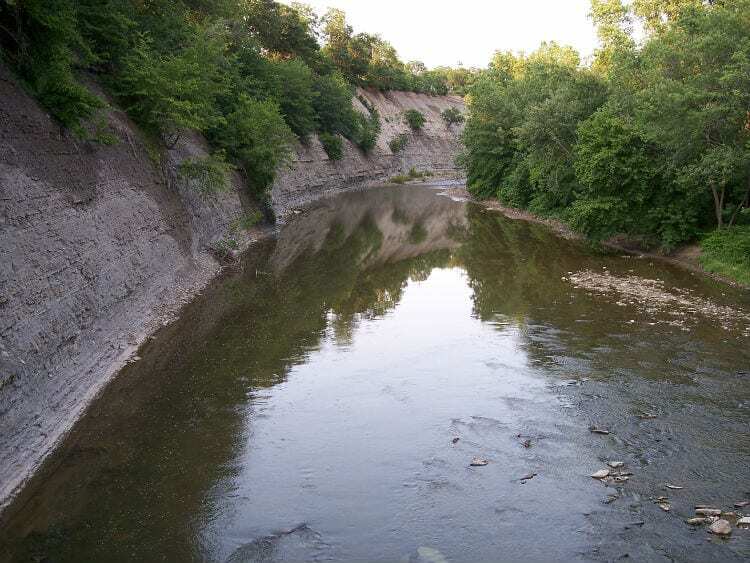 The Rocky River runs through the western Cleveland metro area and is one of five Lake Erie tributaries stocked annually by the ODNR with Little Manistee strain steelhead. The steelhead migrate into Lake Erie during the warm summer months and return back to the river each year in the Fall. The Rocky River is a meandering river with low to moderate gradient with numerous abandoned river fords that provide ideal steelhead holding water. The river is a mostly shallow (and easily-walkable), mid-sized stream with a varying bottom of shale, rock, silt and mud. 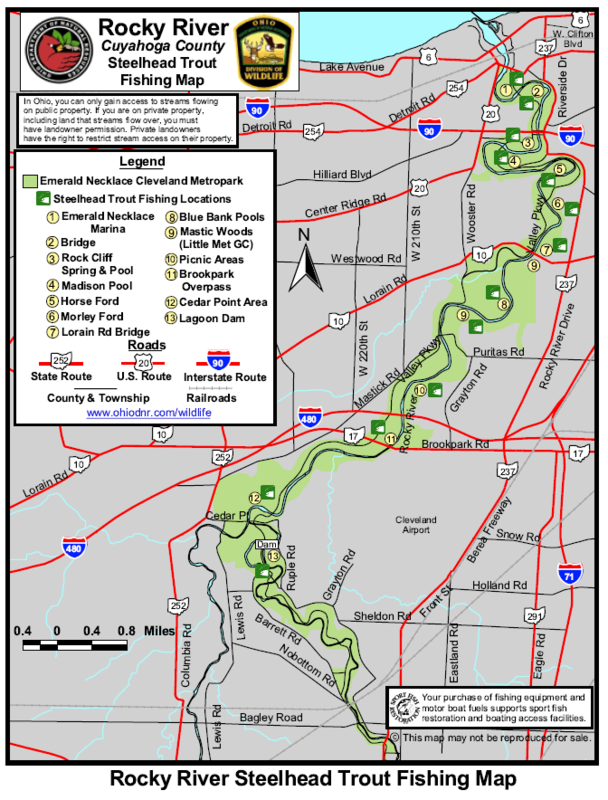 The Cleveland Metroparks owns the majority of the river and its surrounding area, and provides unrestricted access to anglers. Steelhead Alley Outfitters gives us a glimpse of what fly fishing for big steelhead in small Lake Erie tributaries is all about. The main season for the steelhead is September through May. Although rare, steelhead have been caught in the summer months as well, with the exception of July. The USGS Rocky River flow gauge near Berea, OH provides real-time stream flow data. The chart below shows the stream flow (in cfs) for the past seven days. The Rocky River fishes best when the stream flow is between 150-250 cfs. The average run-off time for Rocky River is 2-3 days. When the Rocky River flow gage​ reads 300 cfs and is falling, conditions are prime for fishing and it's time to grab your rod and ditch work. Of course before you run out the door you'll want to check the latest Rocky River fishing report. Mike Durkalec (Ohio DNR) publishes the Cleveland Metroparks fishing report which is an excellent source for the latest conditions on Rocky River. You can make steelhead fishing as complicated as you like or keep it pretty simple. Five rod-and-reel setups that are typical of Steelhead anglers, including spinning, noodle, fly, spey and center-pin setups. A handful of fly patterns, as well as lures that mimic two of Steelhead Alley’s most fed-upon baitfish – the Emerald Shiner and Gizzard Shad are all you really need to get started. If you're fly fishing, a single-handed, 9-ft, 6- or 7-wt rod and large arbor reel with a good drag and floating line will suffice. This setup is great for fishing streamers and tandem nymph rigs as well. If you are into swinging flies, an 11-ft switch rod or 12-ft double-hand spey rod makes life a lot easier. Visit our DIY Guide to Fishing Steelhead Alley for maps and information on other Lake Erie tributaries that steelhead like to visit.